I have this thermal too and can't stop wearing it! I LOVE it in the blue shade though! Definitely your color especially with your year-round tan lucky lady! This top looks beautiful on you, but honestly I don't think there is a color out there that is not flattering on you! You have that coloring that looks amazing no matter what color you wear. This color is so gorgeous on you! I love the style of this top-- and basically anything Free People! SUCH a good color on you!! I ADORE this look on you! I love blue also but I feel like blue can sometimes be hard to pair with jeans (too much blue? Has to be the right shade of blue)...this works perfectly and I love the lace detail! I feel like whenever I wear booties it just doesn't look right with my jeans...I dunno what the problem is. I feel like Christmas sneaks up on me too. My husband's birthday is this weekend (right after Thanksgiving) and that always gets me too! I have been going back and forth on whether or not to get this top, but I love how you're rocking it! Cobalt blue is a great color on you! Those booties are on crazy sale too, but I am nervous to grab them because of the fit. What are your thoughts on their fit? I’m a sucker for any top that has thumb holes! It just ups the coziness factor. Love how you styled this look, and blue looks so good on you! you know i loveeee this outfit. esp the off the shoulder goodness. and that color is so great on you so i'm surprised you dont wear it more. and the bralette is fav of course! Such a gorgeous color on you, lady! Love this whole outfit. Great color on you and one of my faves since it’s kentucky Blue! Love how it’s off the shoulder, too. This color is gorg on you. The thumb holes and off the shoulder - Love Love Love! I love this color too! It's so pretty, and adds a great pop of color for the winter! 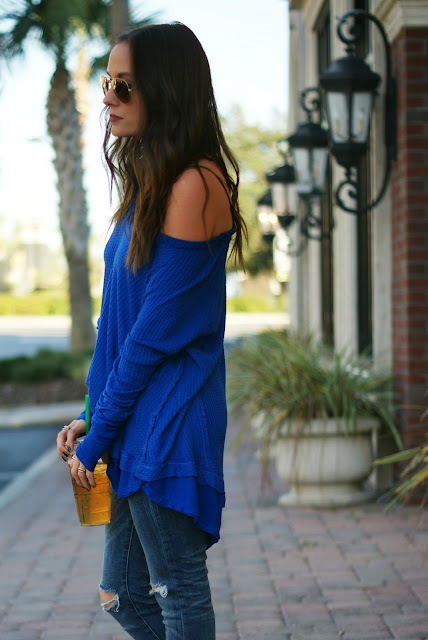 This top looks so cute on you, and I love the ruffle detailing on the bottom! I legit love this look! The boots are my fave! I love this look on you!! That color is so fantastic on you!! This used to be one of my favorite colors to wear and for some reason I don't have any pieces in my closet right now! It looks so pretty on you! This is such a great colour on you!!! I love the drape of the top and the bralette sneaking out! You should wear blue more often, it is gorgeous on you! I have been loving this thermal tee too, it just looks so cozy! I have seen it in so many colors, but I'm obsessed with this blue! The color is gorgeous on you! This look is FLAWLESS on you. I wish I could pull outfits like this off. I feel like I would just look like a hot mess... but you look so perfectly put together!! I'm obsessed with the cobalt - absolutely gorgeous color on you!